The Olympus E-510 is a 10.9 mega pixel digital camera, supports CompactFlash memory and has a 14-42 mm lens. The E-510 certainly shows some pedigree having a solid metallic case where many others plump for less firm materials. The weight is noticeably even without the lens attached, but it is intelligently balanced so as not to immediately put the user at a disadvantages. The grip is comfortably large enough to allow for a decent sized hand to grip round, and the back has more then enough room to plant a thumb without accidentally selecting functions. The Olympus E-510 saves space and battery power by doing without a top LCD, instead employing the rear screen to display current settings. The display is reassuring basic , keep a functionality rather than flashy sensibility. Keeping much of the camera basic can have a detrimental effect on the end image quality, as is evidenced by the portrait shot. Although the focus is sharp and the contrast decent enough. With the sports setting selected both the focus and drive speed is excellent with the constant autofocus keeping up well with the subject. The Olympus E-510 is a robust and well laid out camera, performs up to expectations. Each image is technically impressive and consistent. 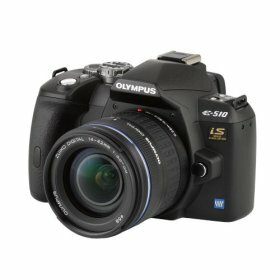 The Olympus E-510 was voted European camera of the year by EISA. The Olympus Evolt e-510 Digital Camera is a beautiful camera with great functions such as Image Stabilisation, a Dust reduction system (SSWF- Super-Sonic Wave Filter) and Live View, it has everything the amateur and professional photographer could want. Having previously used only digital cameras. It is quite lightweight (for an DSLR) and the image quality is vividly breathtaking.